More resources for River Wardens and Riverfly surveyors can be found on the Essex Rivers Hub or on the Riverfly website: http://www.riverflies.org/. To enquire about becoming a River warden please contact us. More volunteer recording resources and citizen science packs can be found on the Catchment Based Approach CaBA website http://www.catchmentbasedapproach.org/volunteer-monitoring. A photo guide for freshwater invertebrate recorders, kindly supplied by Adrian Chalkley, Suffolk County Recorder for aquatic invertebrates. A photographic guide to Great Diving beetles, aimed at the non specialist. This key was kindly supplied to us by the developer Adrian Chalkley, Suffolk County Recorder for aquatic invertebrates. Details on how to survey for otters, water voles, harvest mice and water shrews. The Riversearch otter and water vole survey form can be downloaded below. Please send completed forms to: Darren Tansley, Water for Wildlife Officer, Essex Wildlife Trust, Abbotts Hall Farm, Gt Wigborough, Colchester, CO5 7RZ. A list of the Riversearch survey points, highlighting those that are lacking surveyors. If you can help survey a Riversearch point near you please contact us for details. A guide to our only native crayfish species, Authored by Nick Mott of Staffordshire Wildlife Trust. 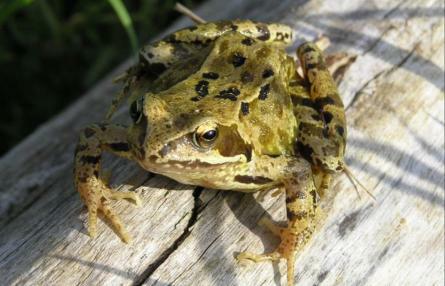 Our partner organisation the Freshwater Habitats Trust is asking volunteers to record sightings of frog and toad spawn in Essex using a simple recording form and online guide, as part of their PondNet survey programme. The survey is interested in records from any pond including garden ponds, village ponds and ponds in the wider countryside - this is all important data for PondNet! Records of spawn can be entered on The PondNet Spawn Count 2017 website, which also contains some helpful advice on identifying spawn, tadpoles and adult amphibians. Click here for more information and to download a Spawn Survey recording form.